Wow, I love this design! I haven't had time to check on your beautiful designs lately, I am sorry! Those nails rock, they really do. The thumb is gorgeous, but defo super time consuming I suppose! Love! I love the colors you used! It looks very nice! i love these SO MUCH! everything about them is perfect! Love this design ! Well executed and good choice of colours ! 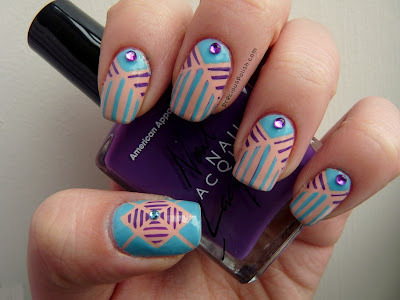 I actually think this is my favorite nail art I've ever seen! Love the color combo and the design. And your thumb... amazing!